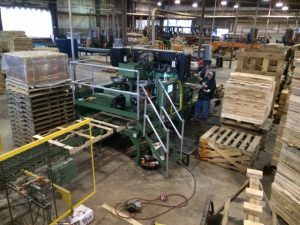 Tharp Pallet Company specializes in custom-built hardwood pallets tailored to meet the specific demands of our customers. Our range of products include hardwood and softwood materials to guarantee quality and cost-efficiency; Heat and chemical-based treatment options to eliminate mold spores and pests; And pre-cut lumber of all sizes. Tharp Pallet Company boasts a fleet of trucks, including both flatbed and dry-van trailers, to accommodate the delivery needs of our customers. Our 33,000 square-foot facility includes loading docks for customer pick-up as well. If you should require any additional information regarding our company and how we can meet your product needs, please call us at (501) 345-2901, fax us at (501) 345-2058. I have used Tharp Pallet for my pallet needs for over fifteen years. Their pallets are of high quality and good value. They are courteous and professional to deal with and deliver in a timely manner. They have never let me down. Tharp Pallet Company was founded in 1981 by F.W. Tharp and son, Freddie. What began as a father-son duo eventually grew into a family affair as Freddie’s sons, Brayden and Bryson, now manage daily operations.